If an aneurysm enlarges, the artery wall weakens and can result in a life-threatening rupture. Aneurysms usually form in the abdomen (known as an Abdominal Aortic Aneurysm or AAA), but can arise anywhere in the body. Mr O’Brien will assess your aneurysm and order appropriate X-rays (ultrasound or CT Scan) to plan its repair. He strives to repair most aneurysms with an endovascular stent inserted into the aneurysmal artery via a small cut in the groin. 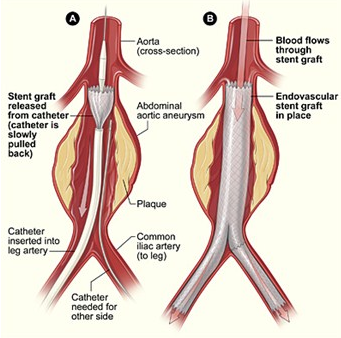 Endovascular aneurysm repair (EVAR) results in less pain and faster recovery than older methods of aneurysm repair. Sometimes, aneurysm repair requires open abdominal surgery, and this procedure often requires admission to the intensive care unit. Only a vascular surgeon can accurately determine if your aneurysm is suitable for endovascular or open repair.